In late August of 2017 hurricane Harvey destroyed the area in and around Houston, Texas. Seeing the devastation and recognizing the local communities’ need for support inspired a group of friends from Nashville and Dallas to band together, purchase a boat, fill 3 pickup trucks with supplies and make the drive down to assist with relief efforts in any way possible. Being on the front lines we witnessed incredible tragedy but also incredible beauty – seeing people of all nationalities, races, religions and political party’s band together to help one another was inspiring beyond words. Backed by countless friends, colleagues and family members back home we like to think that we were able to have at least a small positive impact on those in need. The experience lit a fire in our hearts and we decided to apply what we had learned in Houston to develop ways in which we could be more effective and help more people and pets the next time disaster strikes. 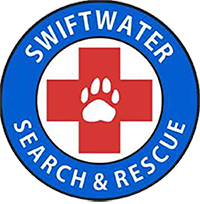 From all of this Swiftwater Search & Rescue was born. After a lot of hard work and several weeks of preparation we are now a fully operational and accredited 501(c)(3) nonprofit organization. Our team is comprised of individuals as diverse as the people that we aim to help. We come from all walks of life and have various skill sets which, when combined, create an incredibly effective unit. Our front lines crew is comprised of police officers, paramedics, electrical technicians, marines and business professionals just to name a few. Our donors and supporters come from all over the continent from as far south as Mexico to as far north as Maine; as far west as California and as far east as Florida. What we all have in common is a love for pets and for helping others.